Once in a blue moon, you stumble across a person who inspires you on a completely different level. The same is the story with Mohit Khare who is a businessman by profession. His journey began on a trip abroad with an epiphany and his transformation is utterly unbelievable. He believes in the mantra that anything is possible once you put your heart and soul into it. If you are struggling with losing weight, let his story be the much-needed inspiration. 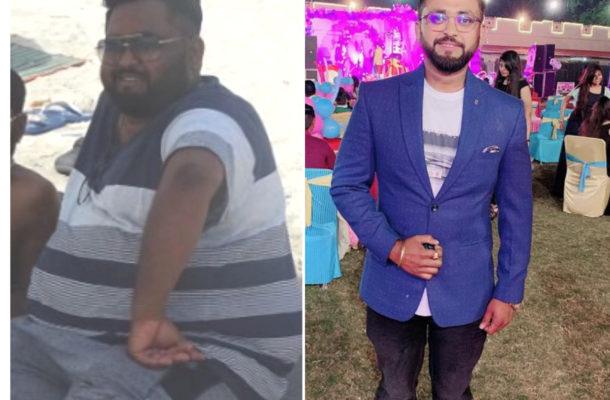 Name: Mohit Khare Occupation: Business Age: 31 years Highest weight recorded:127 kgs Weight lost: 44 kgs Duration it took me to lose weight:10 months The turning point: I was really irritated and exhausted with the way I was leading my life. There were way too many restrictions as being overweight prohibited me from doing a lot of things. For example, last year when I went on a trip abroad with my friends, I was put in the maximum weight category while doing sky diving. It was not only embarrassing but heartbreaking also. I realised that I needed to buckle up and take my life back. My breakfast: I do not eat breakfast. I only have a cup of black coffee that too after working out. I also have some whey after working out. My lunch: I have 1 big bowl of salad with dry papad, 1 bowl of moong daal with a small portion of rice, 2 egg whites, 1 bowl of curd and some green vegetables. Sometimes, I also have rajma-chawal for a change. My dinner: For my dinner, I usually have 300 grams of roasted chicken. I indulge in: I do not believe in the concept of cheat meals or cheat days. My workout: My workout routine consists of weight training, followed by atleast 15 minutes of cardio. Also, I make it a point to change my workout after ever 2 to 3 months. Low-calorie recipes I swear by: I absolutely love the low-cal, roasted chicken that my mother cooks. The recipe is really easy. First, you need to marinate the chicken with curd and spices and then cook it for 20 to 25 minutes. Fitness secrets I unveiled: I realised that shedding those extra kilos was not as daunting and difficult as it first appeared to be. I had been overweight for a long time and it took me a while to realise that if you have the willpower to achieve something, absolutely nothing is impossible. How do I stay motivated? The best part about being fit and healthy is being able to wear all my old clothes. Secondly, I was flooded with compliments and praises after my weight loss journey, which in itself acted as a big motivation. A lot of people started asking me weight loss advice which was a huge confidence booster too. How do you ensure you don’t lose focus? After losing a considerable amount of weight and getting fit, I realised that it is actually hard to control our temptations and keep a tab on the eating habits. But seeing my old photographs and old, ill-fitted clothes keep me motivated. What’s the most difficult part of being overweight? It was definitely not being able to fit into the clothes of my choice. Moreover, in all the group photos with my friends, I always ended up looking like a person from another planet. What shape do you see yourself 10 years down the line ? As of now, I am focusing more on weight training because I want to gain muscle mass. I want a lean, muscular body. What are the lifestyle changes you made? I completely quit having tea and going out partying with my friends daily. I also corrected my habit of eating everything which was in my vicinity. Now, I am more choosy about my food. What was the lowest point for you? It is really hard to get rid of a lifestyle that you have been following for a long time. I was so habitual of going for parties daily and eating junk food, that it made me really upset when I had to revamp the way I lived. But ultimately, the end result was definitely worth it all. Lessons learnt from weight loss: Now I know it for a fact that losing weight is definitely not as hard as everyone thinks, given that you have a rock solid will power. The first 3-4 months are definitely a bit hard, but slowly your body gets used to of the workout and healthy eating.